Here is my contribution to the "Open Road" blog hop at FireCracker. While contemplating what to do I received some wonderful papers from Paper Temptress (currently 20% off on select packages!!) and the colors made me think of Africa and the FCD stamp set "Elephants. on parade" and here are my elephants on the road! The quote I found on the internet and is printed with the computer. Your next stop is at Patty's Blog. I also want to remind you of the Eclipse Challenge! Details are HERE! Wonderful, Hetty! very earthy colors - perfect for elephants! Love the quote! This is so cool! I love what you did with the cardboard and TH die. And the FCD elephant Parade is perfect on this card!!! LOVE IT!!! Gorgeous card but I'd hate meeting them on the road coming back LOL. what a wonderful take of the open roads theme!! I love elephants and the thought of them moving along steadily on their roads is so cheerful! love this Hetty! What a fun scene card you made Hetty! Love the bright bold sun and the background paper is fantastic! Very cool! Love the elephants! Great card. Love the quote. this card is incredible! but the video really touched my heart! I so hope we dont end up having our elephants extinct or just living in zoos! those pics were precious! I love this! The quote is one I wrote down because I want to remember it. The video was very good. Thank you for sharing and thank you for the work you did for us on your blog. Wonderful card - I love the elephants and the colors! Thank you so much for posting this card; I have wanted to make a card using some corrugated cardboard and this is a great example. Oh Hetty - this is just gorgeous! I need to get my stamps out and play!! What a wonderful Card!! I love the background papers and the saying!!! Wonderful card, I love the stamps! Great papercrafting and those stamped elephants look terrific. The sentiment works so well on it too. Love elephants and what a great quote and idea for a card. LOVE it! 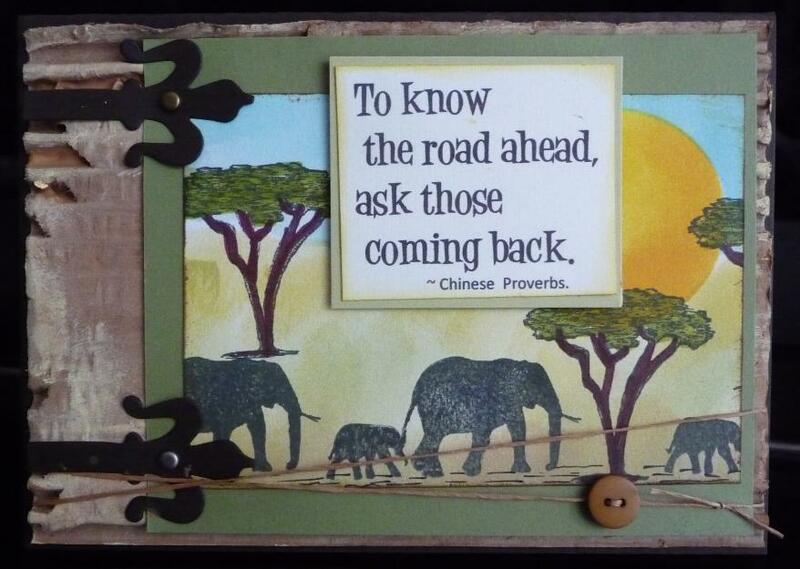 Great quote to go with those awesome elephants! What a wonderful layout and color scheme for these wonderful animals!